Rainbow Volunteer of the Month for May is Valerie Yeakle. Valerie came to Rainbow to volunteer in May of this year. A social worker in the ER at Inova Fairfax Hospital, Valerie received her Master's in Social Work from George Mason University in 2016. She lived in California for a couple years. While there, she volunteered with J.F Shea Therapeutic Riding Center in San Juan Capistrano. Valerie fell in love with therapeutic riding, and is interested in becoming a PATH instructor someday. She started riding at Shenandoah River Farm in Strasburg, Virginia when she was 12, and worked at the stables, helped to train horses, and helped manage the barn for about seven years. 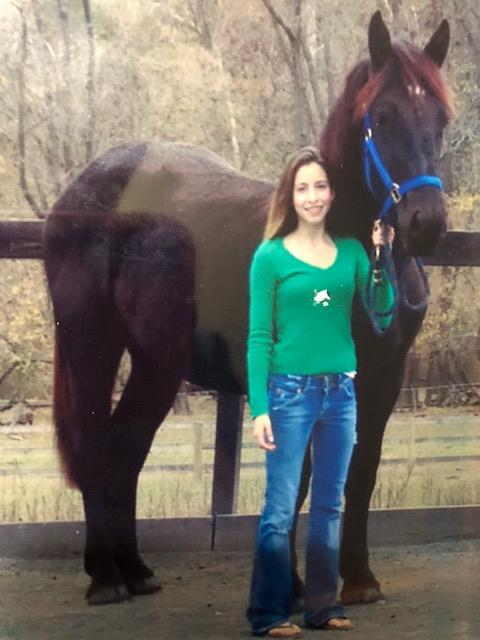 Valerie also owned her own horse in high school; a Percheron named " Petite V" (pictured here). We are grateful too, for your help, Valerie! Thank you for joining our volunteer family here at Rainbow Therapeutic Riding!